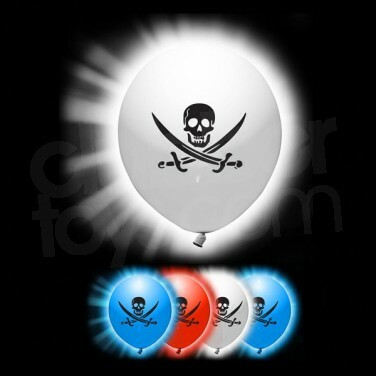 A pack of five funky light up balloons with a skull and crossbones motif, these fabulous LED Illoom Pirate Balloons light up for up to fifteen hours! Each five pack contains a mix of red, white and blue balloons that each contain an LED. Pull the tab from the neck of the balloon on inflation to activate the LED and you will have a swashbuckling glowing balloon for up to fifteen hours! Easy to use, simply pull tab to activate and inflate.